We selected for this week. 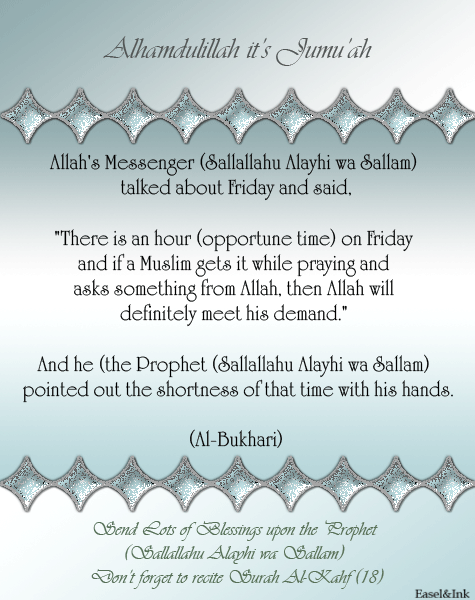 Yawm Al-Jumu’ah starts from Maghrib (sunset) on Thursday till the end of Asr on Friday. Click on the radio to listen to the recitation. 4) Entertainment according to the Salaf. 5) The corruption in present time entertainment. 6) The limits for allowed entertainment in Islaam. 7) The humor of the Prophet sallallaahu ‘alaihi wa sallam . 8) Humor does not contradict servitude. 9) The problem resulting from free time, and how to utilize it.